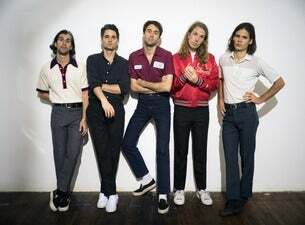 The Vaccines were formed in 2009 in West London. The current members of the band are Justin Hayward-Young, Freddie Cowan, Árni Árnason, Timothy Lanham and Yoann Intonti. After trying to perfect their sound, the band uploaded a demo of the song, If You Wanna, to YouTube in August 2010 which attracted a lot of attention, including praise from Zane Lowe who name it the “hottest record in the world”. The band have released four albums, What Did You Expect From The Vaccines? (2011), Come Of Age (2012), English Graffiti (2015), and Combat Sports (2018). All four albums have made the top 5 of the UK Album Chart, with their second album, Come Of Age, peaking at No.1. They most recently embarked on a UK tour in to promote Combat Sports, and have now announced a new UK tour for 2019.